Sydney Horn is determined to catch her sister. 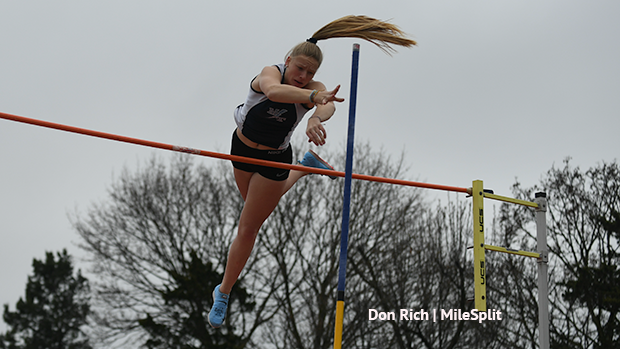 At Saturday's Bruce Dallas Invitational at Cumberland Valley, the Manheim Township junior jumped 13-00 in the pole vault for the first time in her career, a nice early-season milestone that will set her up well for the rest of the season. It also puts her on a good pace to go after her sister Mackenzie Horn's outdoor state record of 13-7.25, possibly by the season's end. While Mackenzie hit that jump during the outdoor season, it was actually set indoors during last year's PIAA District 3 Championships, which was moved inside because of poor weather conditions outside. "It felt really good," Horn said after the competition. "I was going over and I could tell that I made it and I was really happy, so I yelled on the way down because I've been working on 13 for a while." Horn is just the seventh girl in state history to jump 13 feet outdoors in the pole vault. She sits at No. 6 on the all-time outdoor list in Pennsylvania. Below is a look at the outdoor 13-feet club. Not listed below are State College's Lyndsey Reed and Germantown Academy's Liliana Cohen, who cleared 13 or better during this past indoor season. Reed jumped 13-1.5 and Cohen went 13-2.25 in the winter and both will likely push that bar this spring. Horn, who said she's had 13 on her mind since the beginning of the indoor season, noted she's been going through different poles for most of the season. Ultimately, everything came together in some nice weather on Saturday. "It makes me feel more confident, so I can hopefully break my sister's records," Horn said. What's it going to take for Sydney to get to Mackenzie's state record? "Just fixing a couple things with my jump at the top and making sure I'm hitting the end of poles I have," the younger Horn said. Check out our full interview with Horn below.